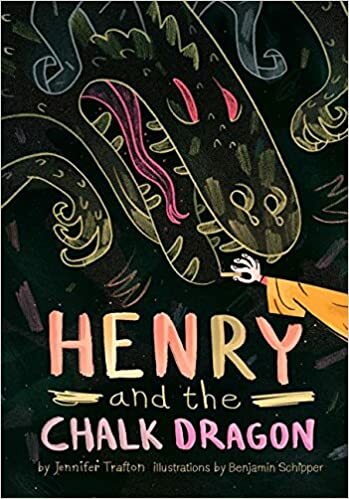 Summary: When Henry draws an amazing dragon on the chalkboard in his room, he’s almost sure he sees it move. Before he goes to bed, he tells his mom he’ll erase the dragon in the morning, and that’s enough to cause the creature to flee. When Henry wakes up the next morning, there’s a gaping hole in his door, and the dragon is nowhere to be seen. It eventually winds up at school with Henry and his friends, Oscar and Jade. The dragon has the ability to morph into different forms, and eventually Henry realizes they are all different pictures he has drawn come to life. Eventually, the dragon causes complete chaos throughout the school, and it’s up to Henry, Oscar, and Jade to use their unique creative gifts (art, science, and music, respectively) to tame it, and to get the school back to normal…or maybe a slightly improved version of normal. 240 pages; grades 3-5. Pros: A fantastic adventure all brought to life by the kids’ imaginations. This would make a good read-aloud in an elementary classroom. Cons: The message–you have to be brave to be an artist–at times overwhelmed the action of the story.